Modify the mobile user interface with a compact layout. Add a global action to add suggestions directly from the Feed. 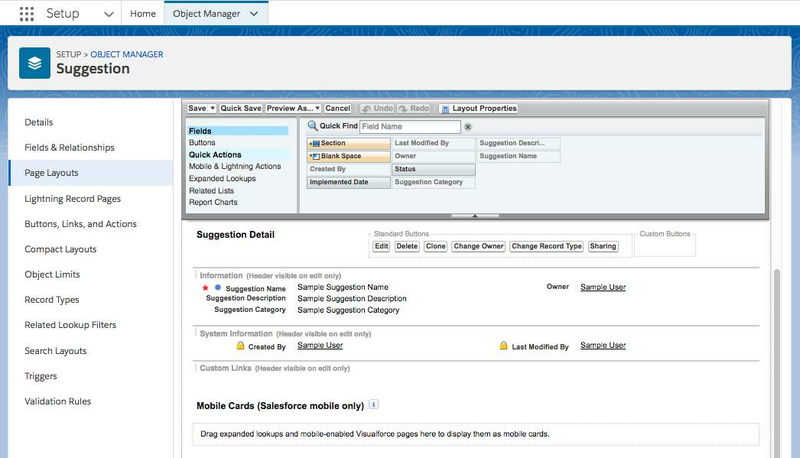 Try the app in the browser or in the Salesforce mobile app. In the previous exercise you created fields to manage the data. Now, let’s make sure that employees have a great experience logging their Suggestions by arranging the fields in a usable manner, bringing the most important fields to their attention and making common tasks easy to do. Changing the UI for the browser and mobile pages involves modifying the Suggestion object's page layout. 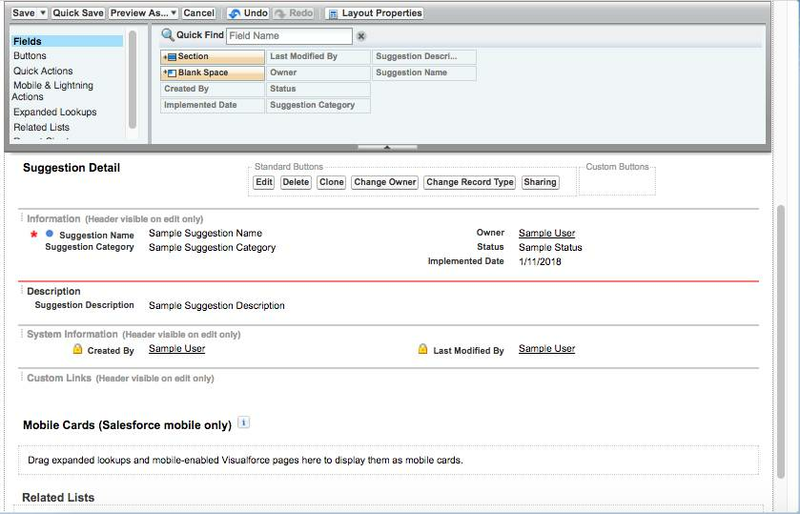 You’ll also modify the Suggestion object's compact layout, which changes only the mobile app UI. Finally, you’ll add a Global Action to make it easy for employees to add suggestions wherever they are in the Salesforce app in both the browser and the mobile app. From the list of objects, click Suggestion. Select the Page Layouts from the left navigation, and click the dropdown at the right of the Suggestion Layout page layout and select Edit. The Page Layout Editor opens. Scroll down to the Suggestion Detail section. In the Page Layout Editor, you can have one or two columns in each section. Let’s add the missing fields and group fields together. Click the Status field and drag it to the right column in the Information section, under Owner. Click the Implemented Date field and drag it to the right column in the Information section, under Status. Now add a new section and rearrange the remaining fields. Add a section for Description. In the palette, click Section and drag it down until a green bar appears above the System Information section. Drop it there to create the section. In the Section Properties box, enter Description for the section name. Choose 1-column for the layout. Drag the Suggestion Description field into your new section. Your page should look like this when finished. Mobile app users can now see the Status and Implemented Date fields, but with a small screen size, it’s useful to display important fields at the top of the screen. For custom objects, the Name field displays at the top by default. To add the other fields, you modify the compact layout. Click the Compact Layouts from the left navigation and click New. Select Suggestion as the primary compact layout. Try to remember what they were doing! You want to make it easier for employees by reducing the number of clicks and keeping them in context. You can do this with a Global Action. Click and select Setup. From Setup, enter Global Actions in Quick Find, then select Global Actions. Click Save. This takes you to the Global Action layout so that you can select the fields to display when the action is selected. 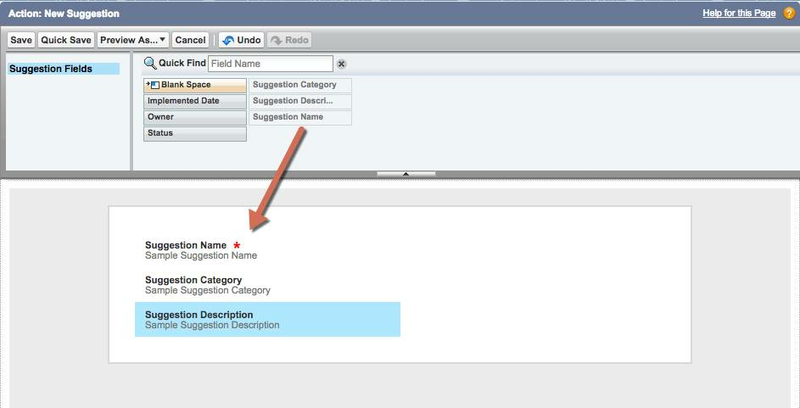 Drag Suggestion Category and Suggestion Description onto the New Suggestion layout so that employees can enter those values when creating a suggestion. In the Predefined Field Values section, click New. Enter the predefined field value details. Click Save. You have created a new action, but users cannot see it yet! Let's fix that next. 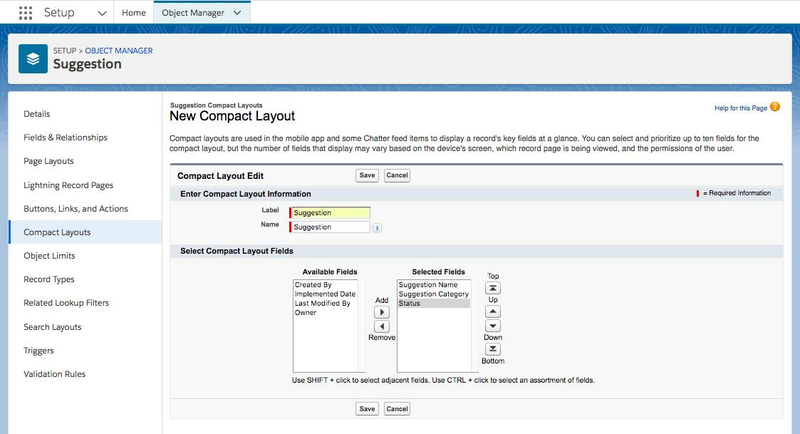 From Setup, enter Publisher Layouts in Quick Find, then select Publisher Layouts. Next to Global Layout, click Edit. 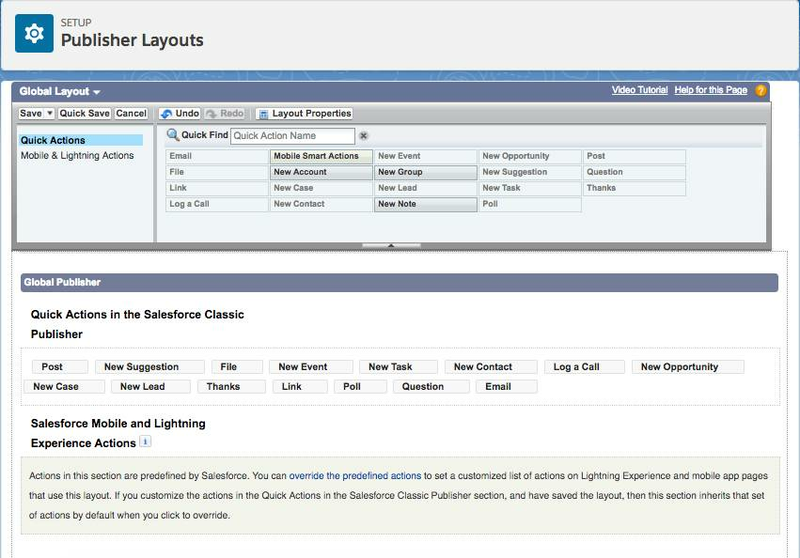 Drag the New Suggestion action into the Quick Actions in the Salesforce Classic Publisher section and drop it in the second position, after Post. In the Suggestions tab, click New and fill out a suggestion. Notice how the experience has changed in the page layout. Switch to the mobile experience and add a suggestion from the mobile navigation menu. You should see the page layout changes and the new fields at the top of the screen from the compact layout change. Finally, add a suggestion from the Feed in the mobile app. Does the global action make it easier? 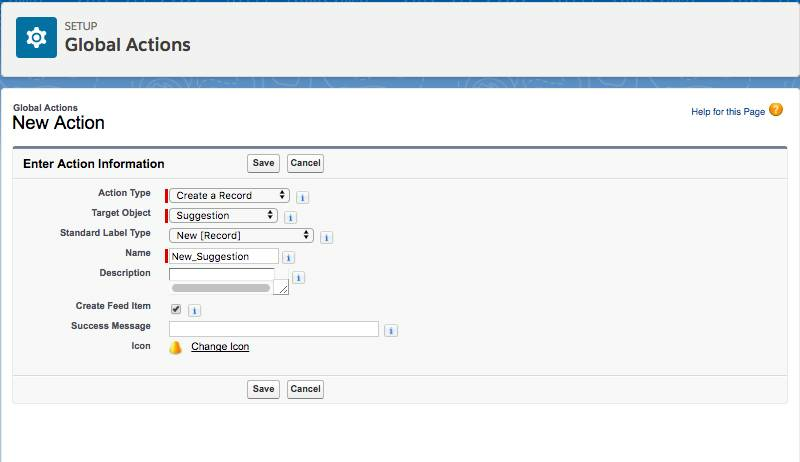 If so, consider updating the page layouts for specific objects (like Contact) to add the New Suggestion action to the action bars that display when viewing those records.